Hal is Dylan’s Autism assistance dog. An assistance dog is like a guide dog in that they are highly trained to be able to assist their disabled owner. We went on the waiting list for Hal when Dylan was about 4 years old and it took just under three years for them to be matched and Hal to be allocated to us. Autism assistance dogs have a unique role in that they assist with anxiety and safety while being outdoors and have a calming and soothing effect on their owners. Before we got Hal Dylan was very difficult to take outdoors, so much so that we were finding reasons to avoid going out at all. Dylan would not hold our hand which for an average 6 year old sounds reasonable however when Dylan would quickly run off when unsettled by an unexpected noise such as a loud motorbike or an unexpected car horn. Dylan also has no road safety in that he isn’t able to clearly distinguish between a car moving neither towards him nor at what speed. When we would try and hold Dylan’s hand he would squirm and try to escape. It was a real fear that we would lose grip and he would run off into the traffic or a busy crowd and become lost. As Dylan is nonverbal we would also find that during a walk out to the local shops Dylan would be pulling away and trying to change direction. Sometimes we would know where he wanted to go such as the direction of the park but at other times we would have no idea with where Dylan was trying to go. He would quickly become frustrated and upset and not being able to express what he wanted and going out was becoming near impossible as his behaviours would quickly escalate. I’m ashamed to say that we kept Grace using a pushchair outdoors way longer that we should have purely to enable there to be a handle for Dylan to hold onto when out. Strangely he would be much happier holding on the buggy than holding our hands and so this was used as a tool to enable us to get out to where we needed to go. Once we had Hal so much changed! 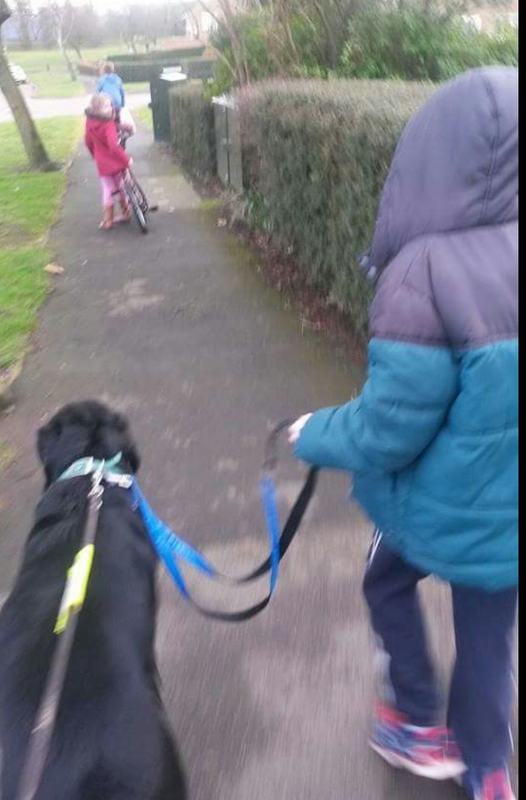 When walking with an assistance dog the dynamic of the whole ‘going out’ activity changes. To explain; I hold Hals long lead attached to his neck but the working dog jacket that Hal wears has two attachments on them; one which has a short handle which Dylan holds and there is also a small connection from Hals coat to a belt around Dylan’s waist. It took time to explore the belt and allow Dylan to adjust to having it on but the holding the handle was fine – probably because it was of a similar feel to him holding onto the pushchair. The fact that Hal and Dylan were connected was a safety feature to prevent Dylan running away or into danger. The only difficulty with this is that when outdoors the public often like to stroke Hal or make eye contact or try and make a fuss of him. Hal loves this but sadly it’s not so great for Dylan who in the past has gotten caught in the rush from Hal to meet his adoring public, In fact its potentially dangerous; Dylan is unable to pre-empt the social element of the situation, so he can’t be prepared for the rush and therefore can get pushed over or injured in the process. Dylan could then become nervous or scared from the unpredictability of being out with Hal and the system just wouldn’t work anymore. Hal loves the attention – it’s not his fault, but if anything can be gained from this post its please do not notice assistance dogs, don’t make eye contact with them, don’t point, don’t make whispery doggy voices at them, do nothing – it’s all a distraction which could potentially harm the bond required for the working relationship to work. When Dylan was younger we had to use the belt for security. Now he’s older Dylan is happy holding on to the smaller lead himself which reduces the chances of him being caught up unexpectedly. When on a walk I am situated behind Hal and Dylan who are walking in front. I give Hal a series of instructions, one by one, to enable him to lead the walk. Hals understands instructions such as to sit at the kerb and to turn left or right. This was the biggest difference that Hal made when he came to our family in that I could give directions to Hal and he would take Dylan where we were going, no upset, not even any real protest, just like that??! Dylan who still has no understanding of road safety is made to stop at the kerb by a 35kg beast that will stop at the kerbside and not move until instructed that it is safe to do so. It was amazing. Hal is a non-threatening playmate for Dylan, when Dylan wants to play Hals there, when Dylan’s not bothered – Hal will go back to snoozing, it’s on Dylan’s terms which works for Dylan and doesn’t add pressure to the whole playing etiquette that society has that leaves Dylan so baffled. Josh and Grace also adore Hal and he has been a lovely addition to the family; having a sibling with extra needs has been tough at times for the younger two but having Hal has been a really positive element which has enriched family life. As a working dog Hal has the same rights in public places as a guide dog and can go into restaurants and parks. During these times – especially restaurants with Dylan’s love of food – Hal can be a reassuring presence. Hal will rest his head heavily on Dylan’s lap or move himself to be there for Dylan to run his fingers through his fur as a safe and reassuring distraction from the wait of the food or the busy chaos of a play park. Hal and Dylan have a huge bond and Dylan knows that when he is struggling or feeling anxious or upset, Hal will be there.